Cultural Organizing | Art2Action Inc. In order to increase the impact of our work, Art2Action partners with national arts networks, community cultural organizations, service providers, student associations, and more. Alternate ROOTS Tampa Rhizome with The Carpetbag Theatre and local veterans at Sacred Grounds Coffee House, October 2013. “Creative Arts Reintegration” with Veterans in Tampa, FL. In partnership with The Carpetbag Theatre Inc. (CBT), Art2Action has been working closely with the Psychosocial Rehabilitation and Recovery Center (PRRC) of the James A. Haley Veterans Hospital, to offer on-going theatre workshops since 2013. We’ve also created a monthly Veteran’s Community Open Mic night, co-hosted by Art2Action and guest artists. In conjunction with CBT’s touring production, Speed Killed My Cousin (by Linda Parris-Bailey) – about an African American woman soldier who returns from Iraq with PTSD, and battles impulses to suicide resulting from Moral Injury – director Andrea Assaf and CBT company members co-facilitate workshops for veterans around the country. In Spring 2017, in collaboration with the University of South Florida (USF) and Americans for the Arts, we’ll be hosting the National Summit on Arts & Health in the Military (with support from the Doris Duke Charitable Foundation), and launching a new series of workshops for veterans at USF. The partnership between CBT and Art2Action was initially supported by the Alternate ROOTS “Partners in Action” grant program. For in-depth information about this on-going work, including INTERVIEWS, ARTICLES & RECORDINGS by Veterans, clinicians and artists, please visit Veterans in Tampa. National Institute for Directing & Ensemble Creation, Pilot Intensive, Minneapolis 2012. Cultural & Gender Equity in the Arts. Art2Action and Pangea World Theatre collaborate on the National Institute for Directing & Ensemble Creation, focused on addressing gender and cultural inequities in our field, as well as emerging aesthetics. 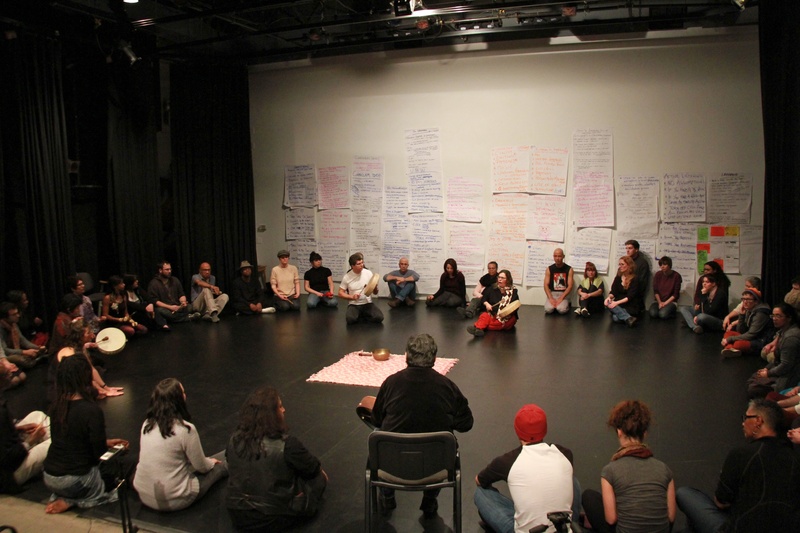 In 2015, we convened the second National Institute, as well as an Indigenous Artists Gathering; and 2010-2012, we co-organized a multi-year pilot program in partnership with 9 national arts networks, all of which serve culturally-specific or community-based arts constituencies: Alternate ROOTS, Consortium of Asian American Theatres & Artists (CAATA), First Peoples Fund, National Association of Latino Arts & Culture (NALAC), National Performance Network (NPN), Network of Ensemble Theatres (NET), New England Foundation for the Arts (NEFA), Theatre Communications Group (TCG); and the University of South Florida (USF). Supported in part by the Doris Duke Charitable Foundation National Projects program, Nathan Cummings Foundation, McKnight Foundation, and the NEA, among others. In 2017, we plan to launch a Next Generation Institute, open for public enrollment … To see a VIDEO of the pilot process & read articles by nationally acclaimed artists, please visit our Institute page! WATCH this fantastic VIDEO about the SEIU Artist-in-Residence program, which includes an interview with Art2Action’s Andrea Assaf! SEIU Artists-in-Residence Pilot Program, with The Arts & Democracy Project. In 2012, Art2Action’s Artistic Director, Andrea Assaf, served as the National Coordinator for an initiative with Arts & Democracy and the Service Employees International Union (SEIU, the largest union in North America), to create an SEIU Artists-in-Residence program. Artists-in-residence with five SEIU Locals, across the U.S., Canada and Puerto Rico, worked with union members to create short devised performances expressing their local culture and labor struggles. These pieces were performed at the May 2012 SEIU Convention, for an audience of over 4,000 union members and labor leaders. To read more about this project, visit the Cultural Organizing page on the Arts & Democracy website! 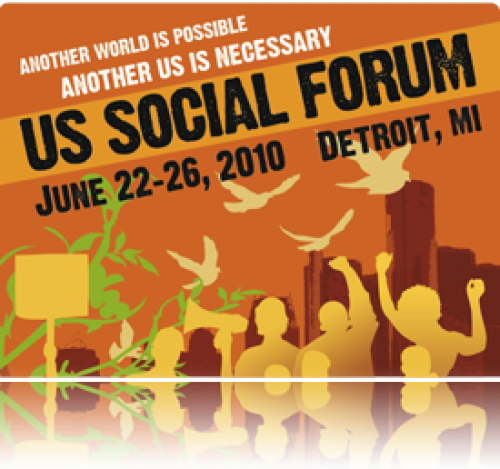 The Creativity Lab at the 2010 U.S. Social Forum, in which over 500 people actively participated in artistic process and workshops, which extended to thousands in street performances and public art events. This project was a collaboration between Art2Action, the Arts & Democracy Project, Alternate ROOTS, Animating Democracy, Leftist Lounge/Culture Clash, Matrix Theatre, MAG-Net, and the Movement Strategy Center/Art Is Change.